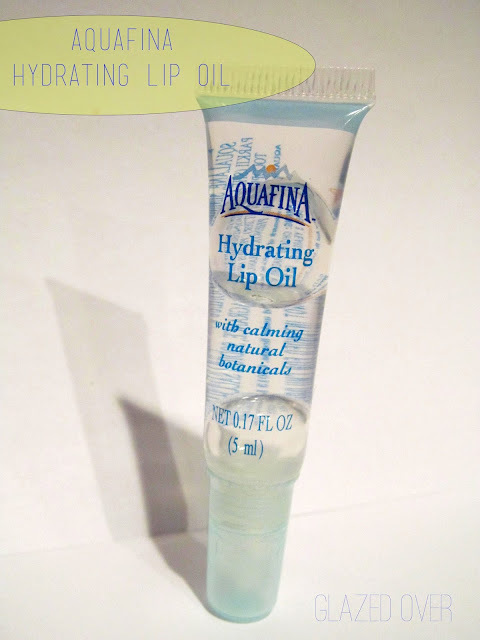 I was randomly browsing the impulse items in the checkout line at the dollar store the other week when I came across something that caught my eye - this Hydrating Lip Oil by Aquafina. Despite my less than stellar experiences with other lip products by Aquafina (But really, what is a water company doing in the cosmetics industry? ), I figured I'd take another chance. I mean what the heck, I'd only be out a dollar if I hated it. A little background: I'm currently on a medication which makes my lips very dry, so this peaked my interest because a lip oil should be mega-hydrating. And it turns out it is. This little lip product is a total gem. It doesn't exactly feel like pure oil on the lips, but it is very light and smooth - more like a combination of an oil and a gloss. And while this isn't an issue for me, I know for some the fact that is smells and tastes heavily like menthol would be a major deal breaker. Once applied it has a nice cooling effect on the lips.It doesn't last overly long, maybe an hour or so tops but I am not the greatest judge as I do have dry lips and I tend to rub them together a lot. Another cool thing about this lip oil is that it's made with good ingredients: jojoba seed oil, sweet almond oil, and shea butter among other things. This stuff has been around forever, but the only place I've seen it is the dollar store. You may luck out and find it at other drugstores and big box stores like Walmart. It's well worth the dollar you'll spend! I highly recommend it. Have you tried this stuff? Let me know!